When I was a child my parents took me to Grange-over-Sands for a holiday and from there we took a coach trip (my father didn’t own a car at that time) to see Furness Abbey. I went with some trepidation, not sure what I was going to see, having misheard the name as Furnace Abbey and expecting fire and flames. 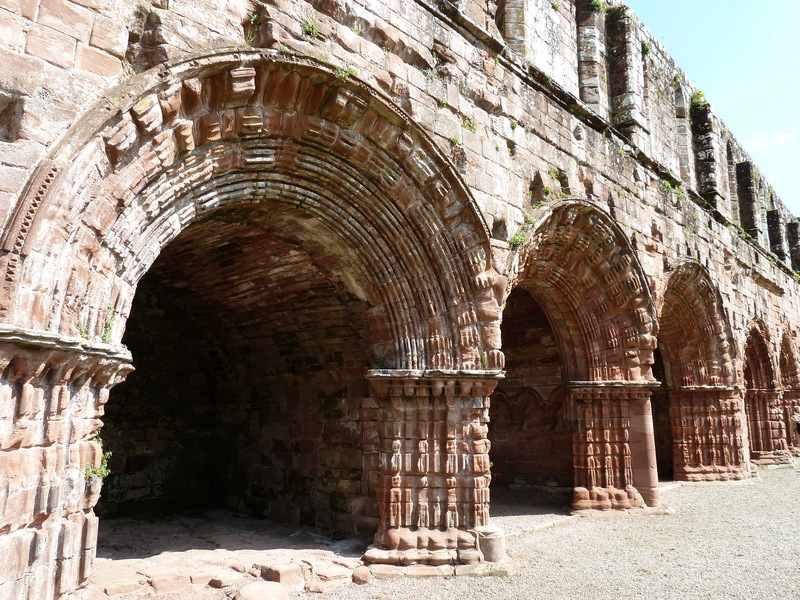 But when the coach stopped by the red sandstone ruins of the abbey I recall being stunned by their beauty and the echoes of their magnificence. Perhaps it was at that moment that I began my lifetime fascination with old buildings and the stories that history whispers to us. Yesterday, I visited Furness Abbey again, for the first time in almost a quarter of a century. It was the same as I remembered it. The walls still glow red in the sunlight and there is still a quiet reverence about the site. The only thing that was different were the girders which are temporarily in place to prevent the walls from sinking. 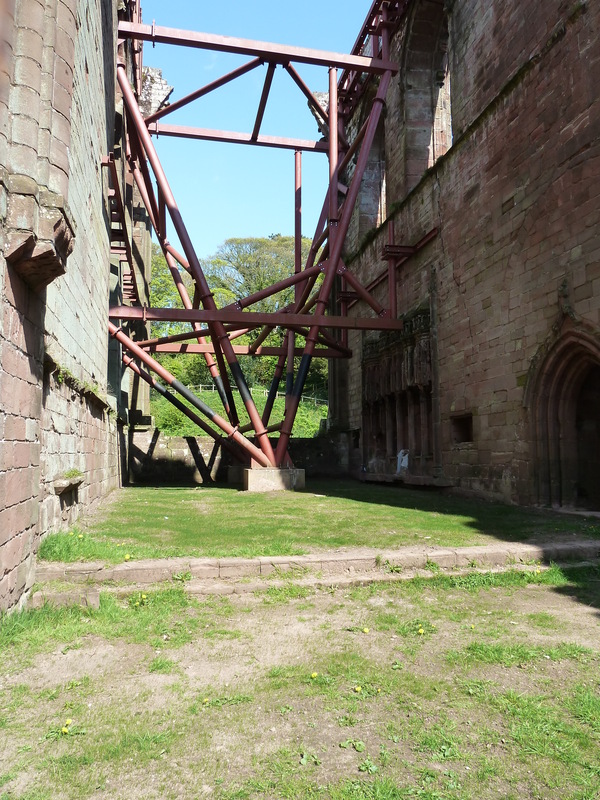 But it was because of these girders that I had asked my son to drive me all those miles back to the abbey – not to see them especially but the treasures that had been discovered because of them. When English Heritage identified a problem with the walls of the abbey church – cracks were appearing as the original wooden foundations deteriorated – remedial work was undertaken and during the excavations the grave of an abbot was found in the presbytery – the sacred space where only priests were allowed. A burial here is unusual as even abbots would have been more likely to be buried in the chapter house. But the discovery of the complete skeleton, still wearing his ring and with his crozier is a rare find. The treasures are on display at the abbey over the May bank holiday weekend and it was to see them for myself that I went to Furness which lies on a peninsula to the west of the Lake District. The crozier, which is shaped like a shepherd’s crook, is a symbol of a high status member of clergy and croziers are carried today by bishops and archbishops. The crozier found in the burial at Furness Abbey is made from bronze, gilded with gold and carried on an ash staff. The emblem at its centre is silver, possibly originally gilded, and shows Saint Michael slaying a dragon. The ring is large and has a white stone which is yet to be identified. It could be rock crystal or a semi-precious jewel. It may have been a reliquary ring with a holy relic concealed within it. The part that lies against the finger is shaped like a pyramid with the point designed to dig into the finger and provide the abbot with an ongoing penance. After the weekend further tests will take place on the discoveries, including the fragment of textile found where the crozier was joined to its staff. Analysis of this may reveal exactly what the textile is made from – it’s is probably a mixture of linen and silk – and it may be possible to say where it was originally woven. Tests will also take place on the skeleton. Part of the thigh bone will be carbon dated and a sample from the teeth will be examined to discover where the abbot lived during his formative years and what his diet was. With luck, archaeologists may be able to name him if the dates coincide with the abbey records. As you may know from previous posts, I’m uncomfortable about taking bodies from the ground in which they were buried with dignity and faith, but in this instance it was preferable to retrieve the body before concrete was poured into the area to stabilise the building. I hope that the findings reveal his identity and that he can be eventually re-interred in his abbey church with a solemn and fitting ceremony. Other artefacts worth seeing at the abbey include some excellent examples of effigies, especially those of two knights wearing their helms which are quite rare. If you’re in the area, or if you want to make a journey through some lovely countryside, do give the abbey your support. Underpinning the walls won’t be cheap, but I would like to think they will still be there in another 500 years to delight both small girls and their adult alter-egos. I hope the artefacts are put on display at Furness Abbey and not taken off to London. I think they should remain where they are found. But no decision has been taken yet, which is why I wanted to see them whilst I could. Elizabeth, that is really fascinating – I wonder if it will be on display later in the year when we go to Barrow? Last year we were defeated by a tropical downpour on the day we planned to visit, right at the end of our stay, and even with protective clothing and brollies it was impossible to walk to round, which was a shame, because the abbey is one of my favourite places. I love the pinky sandstone, and it is so peaceful there you can imagine the monks working and praying… I’m always amazed at just how powerful the abbey was, and how much land it owned on the Furness Peninisula. Next St Leonard’s church at Old Langho, built from the stones of Whalley Abbey.